Newest phase from AR 36 to 16 to the 67 (future I-57) freeway has been completed and now opened to traffic. Sometime in May, there will be a ribbon cutting ceremony (I'm guessing on the bridge over Main St.). It's a nice road with wide shoulders, and fairly straight despite the terrain (between AR 16 & 36). Now, Google Maps needs to be updated... and the Google Satellite imagery is WAY out of date for the area. Do you have any links to maps of the new bypass? Back in January I drove the part between US 67 and AR 36. It seems part of it (north of AR 267) follows an existing county road because there are houses and churches along it. I also thought the road was way over-urbanized in its design as it approached AR 36, with curbs, no shoulders and narrower lanes. That part has been open for at least a year and a half. I think the OP was referring to an extension north of AR 36. Correct. About mapping the new road, its quite hard since I don't have up to date satellite imagery. I like the new road with a couple caveats. One, the stretches that are within the city limits of Searcy should have been built with a turn lane throughout to keep through traffic flowing smoothly. The road isn't well traveled yet but that will change since there is more and more houses / subdivisions going up on the west side of town. North of AR 36, the road has curbs until you drop down in the valley just before you ascend Backbone Ridge. Speed limits are 55 in the rural sections; 45 in the urban sections. The intersection with Main St. is grade separated (YAY!!). Too bad the intersections with 16 and 267 aren't. And now the old section of 13 (south of 267). It needs to be repaved and widened. Curves are non-linear and need to be realigned. Road is narrower too with limited ROW, especially as you near the 67 freeway. It's also subject to flooding since the road itself is barely higher than the fields it travels through. Part of AR 13 follows (somewhat) the old alignment of Honey Hill Rd. Where Honey Hill Rd diverges to the east, the road is all new alignment as it goes south and then southwest to the Des Arc Bayou bridge and then south up a hill, and then down as it meets AR 267. If you go to the Arkansas GIS office Parcels page (https://gis.arkansas.gov/category/parcel/), hover over MAPS and click on MAP VIEWER. You can zoom into Searcy and turn on 2017 aerials, and see the bypass routing in various states of construction. Where does the new highway cross the Little Red River? Where does it end on the north end? Does it meet US 64-67-167 at the CW Road interchange? Is it signed E-W or N-S? I need to get that way soon. There are a couple bridges I need to photograph before they are gone. The new highway doesn't cross the Little Red River. It's northern terminus is at highway 385 just west of the US 67 freeway. It's signed as north-south. 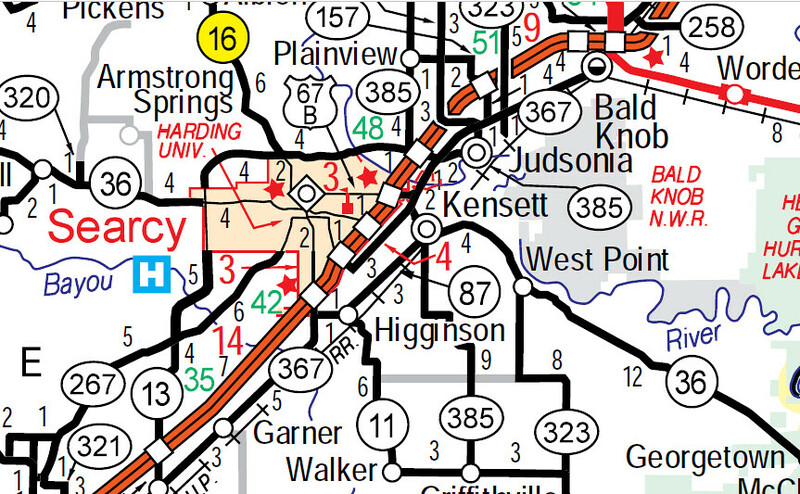 Highway 13 is one odd highway and like so many other AR highways, it's "broken" like AR 110 and 310. Another piece of 13 goes north from Judsonia. If it meets AR 385 just west of Exit 48 off US 64-67-167 west of Judsonia then it has to cross the Little Red River. BTW CW Road was once US 67W. Does AR 13 follow CW Road or was a new alignment built? The aerial imagery at argis.com seems to indicate that it indeed follows CW Road. Sorry about that, it does. I had it confused with another road I guess. Anyways, It does use the very old US 67W alignment from Davis Dr. on east. It's a far better road now. It must use the existing bridge across the river, then. I suppose that’s one way to save money. It does. There used to be an old bridge (one-way) that was took down in the mid-late 1980's. Crossing the old bridge with its wooden planks was rather scary. I never liked that old bridge. The newer (well, late 1980's vintage) bridge is concrete and wide enough to accommodate the widened road.